Have you found the 2018 Scott Plasma Premium Carbon Triathlon Bike 54cm Cheaper? The F01-X230 parametric airfoil was specifically developed for the Plasma 5. 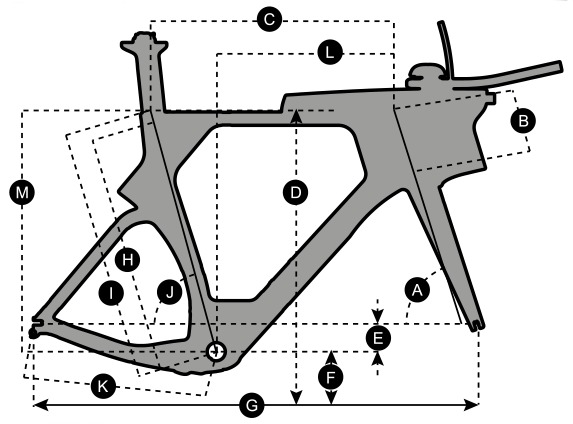 This airfoil concept features a set of variable parameters that can be modified according to the airflow characteristics in each of the frameset’s aero zones. Whether it’s clean, uninterrupted airflow meeting the frame or airflow that has been disturbed by components or moving parts of the rider’s body, with the novel airfoil concept the Plasma 5 has been drastically improved with regards to aerodynamic performance. While a standard Shimano direct-mount rear brake has been properly integrated below the bottom bracket, a proprietary front brake was developed. The low design and aerodynamic shape ensure compatibility with the front brake cover, while an improved leverage ratio and a rigid construction assure reliable and consistent braking power. The fork features two interfaces that allow for the installation of any direct mount or standard brake caliper. Long distance triathletes spend several hours on their bike before switching to the running segment. While aerodynamics and ergonomics are key factors for a fast and efficient bike split, nutrition and hydration are essential to maintain a high pace during both the bike and running legs. With this in mind, the engineering team developed a sophisticated storage system that stands above the rest due to its high degree of usability, while not hampering the aerodynamics of the bike nor the ergonomics of the rider. The aero drink features a clip-on connection that ensures a firm fixation to the stem and allows for installation and removal of the bottle in a matter of seconds. The hydration system offers a low-weight body made from dishwasher-safe material with a large filling opening. A smooth bottle-frame intersection lowers aerodynamic drag due to optimized airflow recirculation behind the bottle. The storage box features a removable divider and sufficient space for up to 8 energy bars. The rubber top cap grants easy access while drain holes at the bottom of the box prevent water accumulation. The solid body shell ensures an optimized airflow while offering enough knee clearance for the rider. The standard 64mm assembly bolt mount ensures interchangeability with a standard bottle cage. The position of the rider directly influences the force distribution during the pedal stroke and consequently determines pedaling efficiency while the position of the rider’s upper body directly affects aerodynamic drag. An aerodynamically positioned torso will lower drag therefore improve aerodynamic performance. Saddle and handlebar adjustability were in effect a major topic during the developmental phase. Considering the idea that this bike would be ridden by riders of all shapes and sizes, from World Tour riders to long-distance triathletes, the Plasma 5 offers a wide range of adjustability to follow suit. What do you think of 2018 Scott Plasma Premium Carbon Triathlon Bike 54cm?